Travel and Tour World, a UK travel magazine, published a report “Chinese province Hunan targets UK market”. 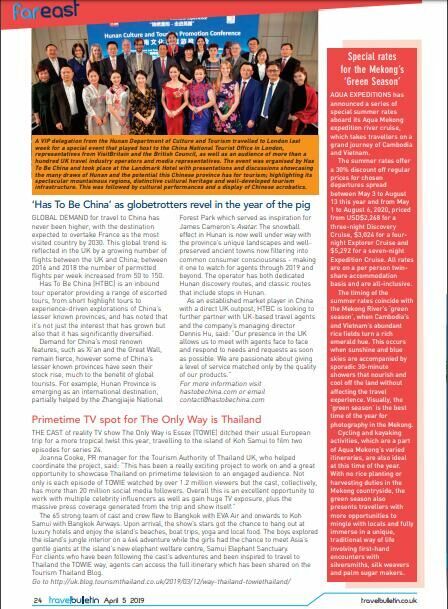 Travel Bulletin, a UK travel magazine, describes Hunan’s culture and tourism promotion personnel, in the report “‘Has To Be China’ as globetrotters in the year of the pig”. 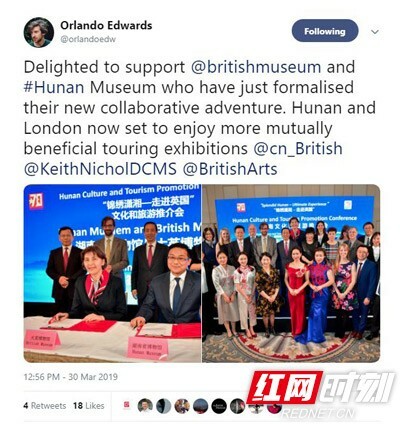 Orlando Edwards, regional manager for the Americas and East Asia at the British Council, promotes cooperation between Hunan Museum and British Museum on his Twitter. The China-UK relationship is in a “golden age”. The 2018 statistics show that the UK has become Hunan’s largest source of European tourists. 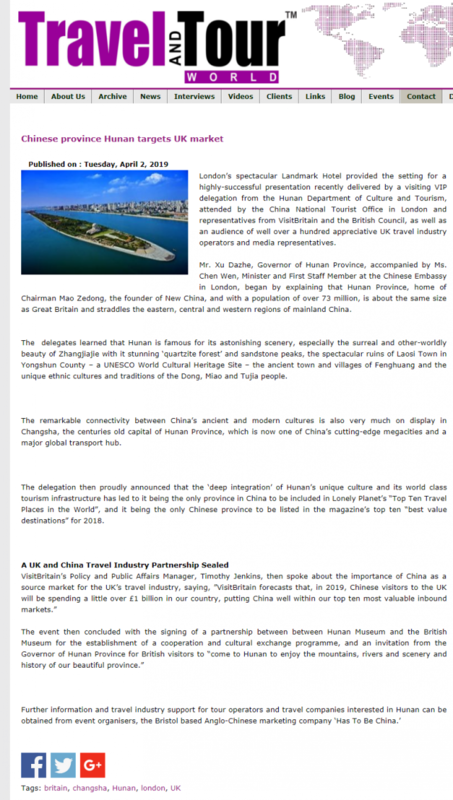 On March 28, 2019, a Hunan culture and tourism promotion conference was held at the Landmark Hotel in London. After that, “Splendid Hunan” was hot on UK’s mainstream media and social media and attracted increasing attention. This was the second Hunan promotion event for its cultural and tourist cooperation and exchange in UK. The first session was last year. It was supported by the Chinese Embassy in UK and organized by the Hunan Department of Culture and Tourism and the London office of the Chinese Ministry of Culture and Tourism. Activities included culture and tourism promotion meetings, photography exhibitions, acrobatics and folk music shows, intangible cultural heritage performances, culture and tourism cooperation forums, project matchmaking and signing ceremonies and visits and tours. Britons were invited to tell their stories, share their trips and experience in Hunan to show Hunan in an all-round way as a destination of “Best Value �C 10 places made for affordable adventures”. Hunan Governor Xu Dazhe delivered a speech at the promotion conference on further promoting Hunan-UK culture and tourism strategic interaction, cultural and tourism industry cooperation, cultural exchange, and friendly-city relationship. As of April 5, there were 21 UK media reports on the “Splendid Hunan” culture and tourism promotion conference, including those in Travel and Tour World, and Travel Bulletin. Travel Trade Gazette, the world's oldest travel trade newspaper, had special coverage of the event. The LEVA-EU celebrated tourists, gastronomes, and traveling websites marked the event on their social media accounts. Orlando Edwards, regional manager for the Americas and East Asia at the British Council, Timothy Jenkins, Policy and Public Affairs Manager at VisitBritain, and Pat Connor, director of BBC South West, also twittered to share their Hunan stories. Wendy Wu, the largest China tour organization and other travel agencies presented sent emails to congratulate the success of the conference.